When assigning MAC addresses to your projects, it’s helpful to understand a bit about them. Most know that there are some IP addresses that can be used safely in a private network, but what about MAC addresses? Well MAC addresses have a bit in them that defines if they are a universally assigned MAC address, one that is assigned by a registered manufacturer, and those that are assigned locally ie by you. 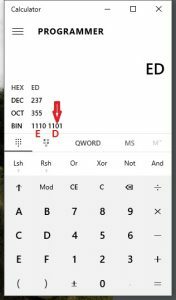 Microsoft’s calculator showing what bit to look for. It’s in the first octet (first two digit hex number) and it’s the second bit that is transmitted on the LAN medium. A quick note on finding the second bit transmitted on the LAN. Transmission is from least significant bit (LSB) to most significant bit (MSB) so if the first octet is ED, it’s binary representation is 11101101 but is transmitted as 10110111. If we use ED as the example, the second bit transmitted is a 0 which means the MAC address is universally administered. A 1 would be locally administered. The Wikipedia article referenced below has more information including discussion on unicast and multicast which is defined by the least significant bit of the first octet. In short, I use A as the second “digit” of the first hex octet as that ends in 10 meaning locally administered and frame meant for to reach only one receiving NIC. The rest of the MAC address just needs to be unique within my network.